Sweat Smart Centres are your specialist treatment centres which offer a complete range of professional, non-surgical treatment options available to help you make the best decision to manage or alleviate your condition. In addition, they're one of the only places in the UK to offer miraDry, a revolutionary solution to underarm sweating. Here are our current Sweat Smart Centres in the UK. Head to their websites to contact them and book your consultation. miraDry - A safe, clinically proven*, non-invasive procedure for the underarms, miraDry uses electromagnetic energy which is delivered to the skin using a specially designed hand piece. The energy is carefully targeted to the area where the sweat glands are found and destroys them. Sweat glands do not grow back, so the procedure gives a lasting and dramatic reduction* in underarm sweat, as well as reducing odour. Iontophoresis – This treatment uses water to conduct a mild electrical current through the skin's surface to interrupt sweat production. It is thought that the electric current reacts with the mineral particles in the water to thicken the outer layer of the skin and block the flow of sweat to the surface. The effects are temporary. Sweat Reducing Injections - Work by blocking the release of chemicals from the nerves that send signals from the brain to the sweat glands, thereby reducing sweating. You may want to consider injections if prescription antiperspirants or other options have failed to work for you. Multiple injections are given to the area being treated and the reduction in sweat is seen almost immediately, however are only a temporary solution. Antiperspirants - Antiperspirant must be frequently reapplied to be effective and some people find that they have a negative reaction, causing the skin to become irritated. Many hyperhidrosis sufferers find that they can manage their excessive sweating using this treatment. However, if you find that prescription antiperspirants don’t work or cause irritation, you might want to learn about further treatment options. Registered with the Care Quality Commission, MediZen has over 10 years' experience treating people who want to reduce the impact that sweating has on their lives. The MediZen Sweat Smart Centre is one of the only centres in the UK to offer miraDry, a revolutionary permanent solution to underarm sweating. 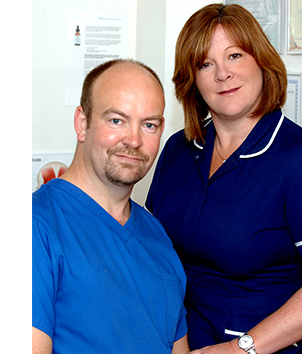 MediZen, situated in Sutton Coldfield, West Midlands, was established in 1999 by Dr David Eccleston and Annie Eccleston RGN (pictured right). Registered with the Care Quality Commission, MediZen has over 10 years' experience treating people who want to reduce the impact that sweating has on their lives. During your free consultation, we will provide expert guidance as we help you to fully explore the miraDry procedure. Click here to visit MediZen's website and find out more about miraDry and how much it costs. * Long-term Efficacy and Quality of Life Assessment for Treatment of Axillary Hyperhidrosis with a Microwave Device. Mark Lupin, MD et al; Dermatol Surg 2014; 40: 805-807, click here to view full article. * More details on clinical study can be found - Clinical Evaluation of a Microwave Device for Treating Axillary Hyperhidrosis, H. Chih-Ho Hong, MD, Mark Lupin, MD et al; Dermatologic Surgery 2012; 38:728-735, click here to view full article. Manchester’s Premier Private Dermatology clinic. Conveniently located in South Manchester, Cheadle village town centre. Everything Skin Clinic™ is one of the very few Dermatology clinics which offers treatment of all skin conditions under one roof. Our team of highly trained Consultant dermatologists have completed specialist training in Dermatology and are on the specialist register of the General Medical Council. All our consultants hold substantive contracts with the best Dermatology centres in leading NHS hospitals. You can, therefore, be assured of the highest quality private dermatology care. Our clinic is unique in that all aspects of dermatology are catered for. From blemishes to eczema or psoriasis, facial redness to mole mapping and mole removal, from excision of melanoma to Mohs Surgery for basal cell carcinoma, any skin, hair or nail disorders are diagnosed and treated at Everything Skin ClinicTM by our expert consultant dermatologists. To contact about treating problem sweat please use the form below.